Free Duplicate File Finder: Find and Delete Duplicate Files for FREE! Is your computer filling up and cluttered with duplicate files, images, movies and so on? Do you know that you can recover more value disk space by deleting duplicate files? Very often, you may create duplicate copies of file stored previously in another directory, or the applications may litter your hard disk with duplicate files, so the duplicate files may take up much-needed hard disk space. And now you can easily to find and remove the duplicates to free up your disk space with Free Duplicate File finder. 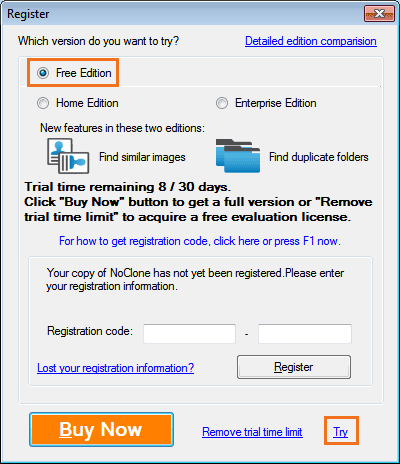 NoClone Free Duplicate File Finder has a new designed user-friendly interface that is easy to use. Get this free duplicate file finder now to recover more value disk space! What Free Duplicate File Finder can do? NoClone uses True Byte-by-Byte Comparison that ensures the duplicate files uncovered are exactly the same in content, so that it can find exact duplicate files regardless of file name. NoClone will search for mp3 with same Tag data in mp3 files. Some mp3 is duplicate in case of tag data like same title and artist, but different in file content due to different sampling rate. NoClone supports most popular image formats. After finish the scan process, NoClone shows you all the duplicate images in groups so that you can easily to manage the duplicate images. NoClone can detect duplicate emails based on email content, subject, received date, recipients / senders and body size. With NoClone you can organize your outlook emails more efficiently. Guide: How to use Free Duplicate File Finder to find and remove duplicates? First you need to have NoClone Duplicate File Finder downloaded and installed. Then check Free Edition to launch Free Duplicate File Finder. Set up search criteria to speed up your search and restrict files to those you are interested in before start to find duplicates. Note: NoClone Free Duplicate File Finder only allows you to search 100,000 files in single session and remove 3 duplicates files at a time. To increase number of files to be searched in single session and find duplicate folders and similar images, you can click here to upgrade to FULL versionn.